Hi here's my lonely, lonely male Yellow-headed Dwarf Gecko in his re-done bioactive tank. His last one had too many flatworms/nemetereans . Carefully cleaned everything and new plants and substrate, good to go again. Just wish I could find a female for this poor boy, who you can see basking (sorry pic is not great). Live in Ontario Canada, any leads to FEMALE of this species would be great. Whoever imported them here messed up...they sent males only to all the stores that ordered them. Not that anyone seems interested...but just want to document, that I caught this guy eating CGD. The Pangea Growth/Breeding formula. Existing literature says this species does not eat fruit/prepared food. Wrong! I will try to get a picture but he is so alert, shy and quick that will be difficult. He has some mourning gecko room mates, maybe saw them eating and and decided to try? Now I know why he is so chunky! I wonder whether anyone keeps these in the USA right now. Last edited by Elizabeth Freer; 01-07-2019 at 11:55 PM. Don't know how I missed your first post - LOVE your tank! 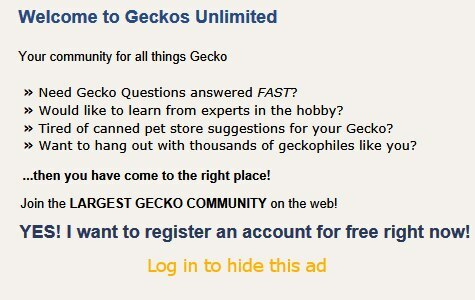 It looks great, and your gecko should be very happy there! Are you planning on breeding them if you find a female? It's possible that the breeder who exported them only sent males as the females are more desirable for breeding more, for more $$...so likely they might be held back. As for the food - yay! Goes to show, there's always an exception, or information that needs updating. Anyway, I'm sure your little fella will do great. Have fun! Neither GU's pakinjak nor Nathan Shepard keep them now. "I recently saw Josh's Frogs at a reptile show with several species of Gonatodes including fuscus. . . . . .They may still have some online." Josh's Frogs has 7 of them available right now: https://www.joshsfrogs.com/yellow-he...tive-bred.html - but I believe they are unsexed as they are young. You might call or email and ask if they have any female adults available. Thanks for the replies!! yay finally!!! . Thanks for the leads too but I am in Canada, cannot get animals from any American vendors as they do not ship here. Yes, he needs a mate. I have a few geckos that split when I blink too. I'm making their environments more secure.